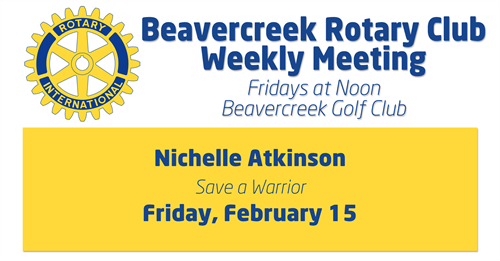 Every Friday from Noon to 1 p.m.
We invite you to join the Beavercreek Rotary Club Friday, February 15th for our weekly meeting. You'll enjoy lunch, conversation with other folks who are doing good in the community, and an informative and inspiring speaker. On Friday, February 15th, we welcome Nichelle Atkinson with Save A Warrior - "SAW". Having shown nearly 700 Warriors The Hero's Journey home, Save A Warrior?™ (SAW™) is a meaningful conversation about the nature of human experience. A nationally-recognized program, they offer novel, judgment-free solutions to returning Veterans, Active Duty Service Members, and First Responders with Post-Traumatic Stress (PTS). Meetings are held at the Beavercreek Golf Club and begin promptly at noon. You'll want to arrive by 11:45 to check in and get lunch before we start. You can count on us to conclude the meeting by 1:00. If you're not yet a member of the best service club in Beavercreek, we invite you to come any Friday. Drop us a private message and we'll put you in touch with a member who'll be happy to host you as their guest. See you Friday at Rotary!